In his last campaign swing of the 2012 election, President Obama today made his final pitch for support in Wisconsin, urging voters in the critical battleground state to trust him - and not Mitt Romney - with the change America needs as they head to the polls tomorrow. The president, growing hoarse before a crowd of 18,000 in Madison, acknowledged that the change he promised four years ago has been slower in coming than some people - himself included - might have hoped. But at the end of the day, he said, voters have a reason to trust him. "Wisconsin, you know me by now. You may not agree with every decision I've made -- you know, Michelle doesn't either. You may be frustrated at the pace of change. I promise you, so am I sometimes. But you know that I say what I mean and I mean what I say," he said, ticking off a list of accomplishments from his four-year tenure. "You know where I stand, you know what I believe, you know I tell the truth... So when I say, Wisconsin, that I know what real change looks like, you've got cause to believe me because you've seen me fight for it, you've seen me deliver it, you've seen the scars on me to prove it, you've seen the gray hairs on my head to show you what it means to fight for change. Amid a recent shift by the Romney campaign to embrace a "change" message of its own, the president has been vehement in his efforts to discredit the possibility that the former Massachusetts governor would truly embrace new, forward-thinking policies. "Governor Romney's a very talented salesman and in this campaign he's tried as hard as he can to repackage the same old bad ideas and make them out to be good ideas," the president said. "He's trying to convince you that these bad old ideas are change...Giving the power back to the biggest banks - that's not change... Refusing to answer questions about your policies until after the election - that's not change, that's the oldest game in the book!" This election, said Mr. Obama, is about "trust." "I ran because the voices of the American people - your voices- had been shut out of our democracy for way too long by lobbyists, and special interests, and politicians who will say and do anything just to keep things the way they are. To protect the status quo," he said. Republicans, he said, are counting on voters to be so "worn down" and "fed up" with the squabbling and dysfunction in Washington that they "give up and walk away" and "leave them right where they are pulling the strings." "In other words, their bet is on cynicism," he said. "You know what? Sometimes you've got to fight. Sometimes you've got to stand on principle. If the price of peace in Washington is cutting students off financial aid or getting rid of funding for Planned Parenthood, or letting insurance companies discriminate against people with pre-existing conditions, or eliminating health care for millions of folks on Medicaid who are poor, or elderly, or disabled - I won't pay that price. That's not a deal I'll take. That's not bipartisanship...that's not change. That's surrender. That's surrender to the same status quo that's been squeezing middle-class families for way too long." 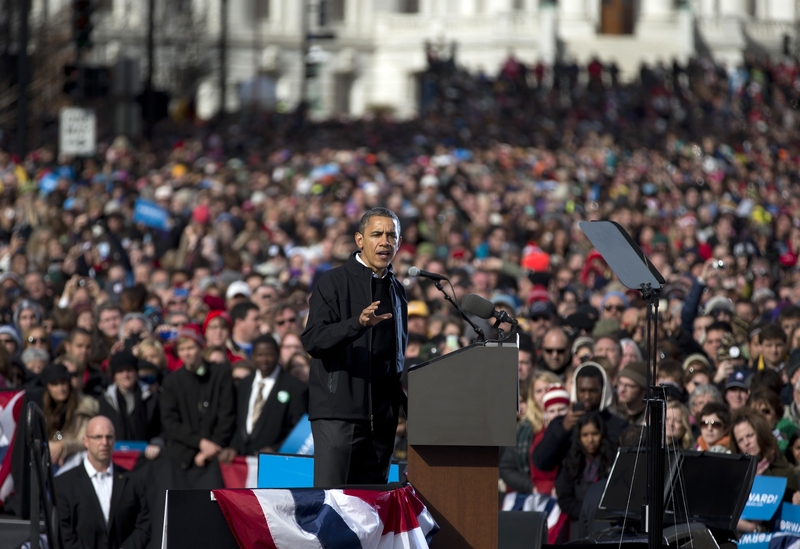 Circling back to his 2012 refrain, Mr. Obama called on Wisconsinites to "keep pushing forward." "We'll finish what we started," he said. The president's final campaign events reflect the importance his campaign sees in holding onto his so-called Midwestern firewall. After his Wisconsin rally, the president heads to Ohio and Iowa for his final rallies of the 2012 election.